B&W image of NCR Century Series 151 Computer. 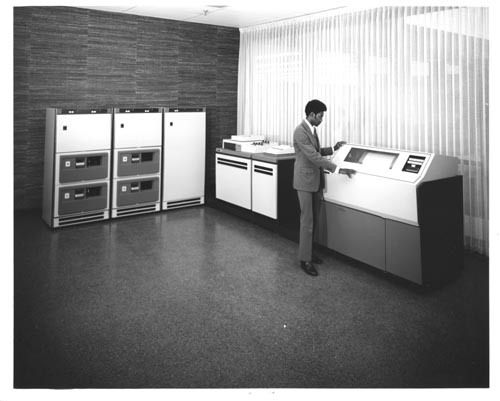 A man is standing in front of a line printer, to his rear are disk drives with contrtoller and between them is the computer itself with controls. New NCR Century 151 computer is a low-cost, high-performance unit with an expandable MOS memory. It is particularly adaptable to manufacturing companies or wholesale firms with large inventories and retail organizations with growing numbers of accounts receivable. With a 300-line-per-minute printer and a 30-character-per-second I/O writer, it rents of $2,675 a month,."